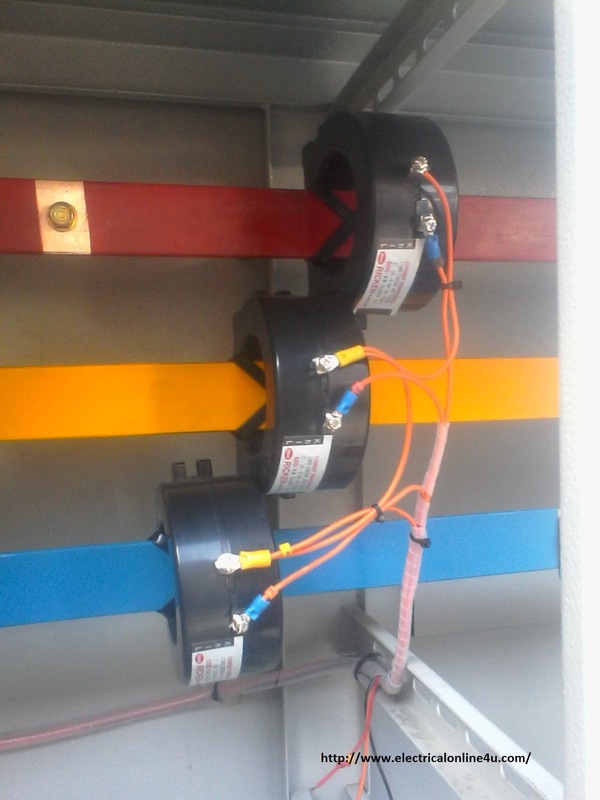 As You know that i already published posts about the CT Coil current transformer installation wiring and installation with Ammeter. But in this post you will learn about how to install the current transformers for three phase. As you know that always we need ct coil and ampere meter in main panel board for measuring amperes (Load) and one thing more that in this post i will show you the image of three current transformer installation in main power panel board. Recently i capture an image of ct installation in panel board. In the panel board we use three colors for three phase power supply Red, Yellow and Blue and black of neutral and green for Earth connection. However in this post you will learn the installation and wiring connection of three CT - Current transformers and the wiring connection of with ammeters. The connection of CT is to easy and the best place of installation of CT in electric power panel board is to connect it with incoming supply wires and connection. Mostly we use Copper Strips for main sharing connection in power board because we can easy get power connection from copper strips and better for high load. In the below image i shown CT Coils installation with copper strips. So In the the above image i shown how to install the CT coils for three phase but this is just an image, not the full and complete ct coil wiring guide. As you know that i always try to tech completely and write complete and simple post which easy to understand. So how to connect it with ammeters, so for amp meter wiring learning i published a post and if you don't read our last post then kindly read it before the below post. and then come to this page. How to wire ammeter with CT coil? How to wire a digital amp meter with Current transformer? How to wire an Digital Ammeter, volt and HZ meter with CT and supply? Mostly we install an ammeter selector switch for three CT coils, from which can check all phases load with one ammeter and i will also publish about post about this soon but here i this below CT diagram, i don't use selector switch because this is a basic post and after that we will write with details in other time. In the above diagram i shown three ammeters current transformers, in the above CT wiring diagram i common a wire of all CT s, my means that i connect CT one connection with one another. I can also do it without connection with one anther but the main reason behind this is that in real life we do our wiring like above diagram in our main power panel boards. I shown three phase supply with red, yellow and blue colors lines. So in this post you learn about installation of current transformer and IN SH ALLAH Soon i will write about the current transformer installation CT coils with Ammeter and voltage selector switch. why don't we connect a single ct coil directly to a single phase .. i mean why there is need for common all the am meter terminals and ct terminals ? Dear you can also do this connection with your method but in electrical panel board if you do this wire single single ct to meter then this will be waste of wire and time. Dear i make a diagram about this you can find it by using our blog search" search selector switch" and you will be find it. i have one machine which has input is 220 volt 3 phase (6 amp, 1.5 kw). how i connect this machine?